UPDATE TUESDAY: Celebrity released the first render of the vessel in its entirety. She will feature the vertical axe-bow design as well as a blue hull. Also note the ships funnel. Celebrity has never shied away from bold funnel designs. The Solstice class of ships had two smaller funnels. The trademark ‘X’ can be seen when looking head on (where the blue part is). The new Edge Stateroom with Infinite Veranda is essentially a balcony and stateroom combined. You can think of it as french doors. This technically creates an enclosed space so it’ll add to the ships GT as well as cabin square footage. In fact they’ll be 23%larger and even the bathrooms will be 10% larger. The Retreat is similar to the ship-within-a-ship concept that we’ve seen with other lines. The difference here is celebrity has two new category of cabins. There is the iconic suites. These are above the bridge and offer 270-degree views. Then there’s the edge villas. These are two story rooms that have their own private plunge pool. There will also be a dedicated lounge for suite guests as well as a restaurant. 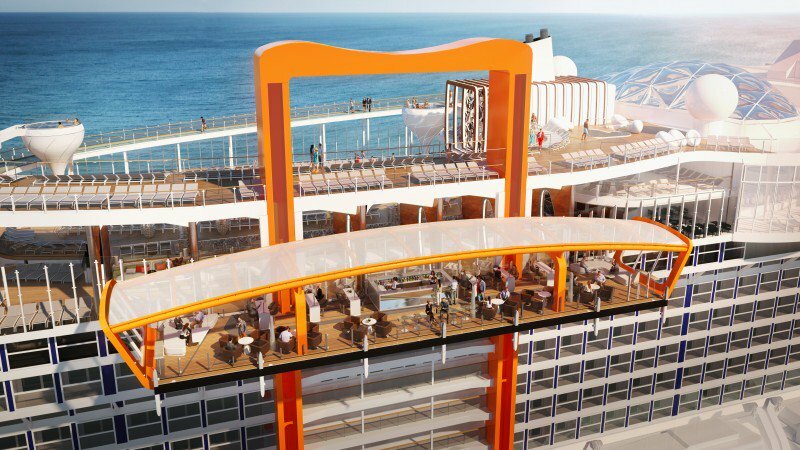 The highlight of the ship will certainly be the magic carpet. Scaling the side of the ship, the platform will actually be able to scale all 16 decks throughout the day. The venue will range from a pool area, during the midday while it’s at the top of the ship. Then to a restaurant during the evening when it descends to deck 5. It can go down to deck two and become the tender platform. 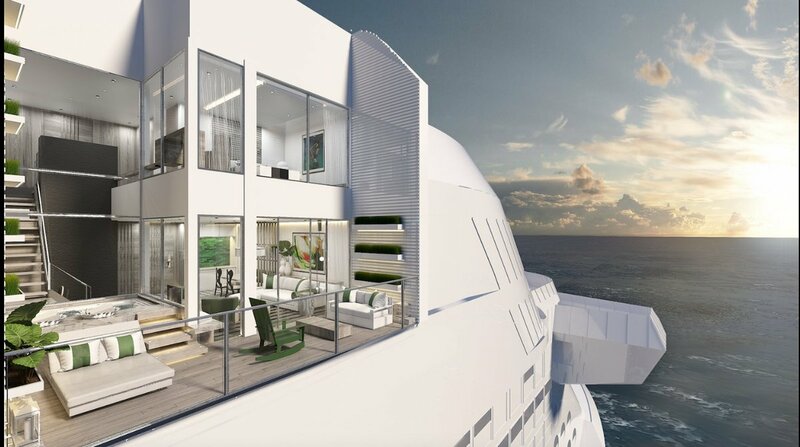 Celebrity then dropped that ship will also feature a roof top garden. This ship wont look like many other ships as she’ll incorporate an axe bow. She’ll look similar to the AIDAprima. Initial renders also give her a dark blue hull as well. 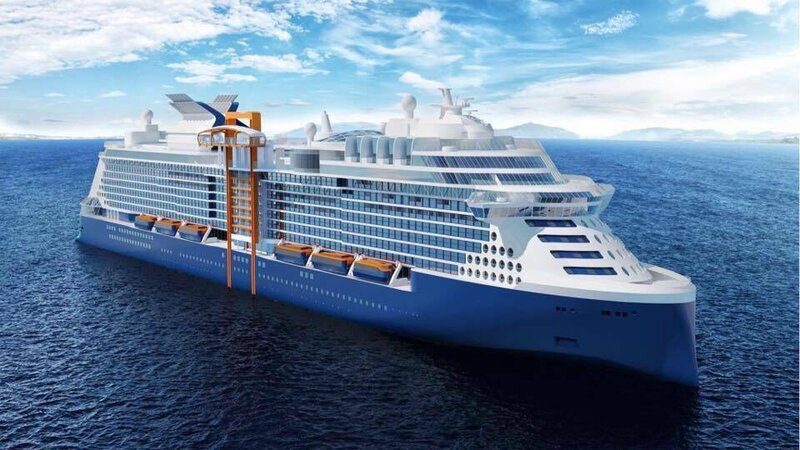 Currently under construction at STX France, the ship will be delivered in December 2018. She’ll be based out of Port Everglades and sail to the eastern and western Caribbean. celebrity cruisescelebrity edgeRoyal Caribbean Cruises Ltd.